New Brunswick, N.J. – Caring for cancer patients may be the first thing that comes to mind when thinking about the work of an oncology nurse, but the role involves so much more. At Rutgers Cancer Institute of New Jersey, oncology nurses also mentor fellow nurses, create educational materials for patients and their peers, and even conduct research. To recognize the scope of their work, Rutgers Cancer Institute nurses were celebrated this week with Oncology Nursing Excellence Awards given during the annual Elizabeth Gibby Osborne Lecture. Heralded for her “exemplary knowledge and patience,” Chandrika Jeyamohan, RN, MSN, APN-BC, CCRC, of Princeton was selected by colleagues as this year’s award recipient in the category of Advanced Practice Nurse. Having been a nurse since 1989, Jeyamohan has served in many roles including that of critical care nurse, clinical research nurse care coordinator, research nurse clinician and advanced practice nurse. Jeyamohan’s peers describe her as a mentor who is “always willing to educate and assist whenever the need arises.” Her work in clinical practice and research spans multiple areas including melanoma and prostate, kidney and bladder cancers – a unique range of experience which her colleagues say is quite valuable: “While working as an advanced practice nurse, Jeyamohan’s familiarity with research has allowed her to guide patients as they transition between clinical trials and standard of care and allows her to continue to fully participate in a patient’s care regardless of whether they are on a trial or traditional therapy.” And whether it’s checking in with colleagues on patient cases on her day off or “effectively communicating clinical trial rationale to patients,” Jeyamohan’s peers note patients can always count on her. Described by her peers as “a valuable resource” to patients and colleagues, Josephine L. Machado, MSN, RN, OCN of Union Township was chosen for the award in the Generalist Nurse category. A nurse since 2006 with experience in oncology (both inpatient and outpatient), hospice and the medical-surgical area, Machado earned a Master of Science degree from Rutgers University earlier this year, having majored in the Adult-Gerontology Nurse Practitioner Program. In the absence of the nurse manager, Machado serves as the charge nurse in the adult treatment area – responsible for the daily flow of operations. 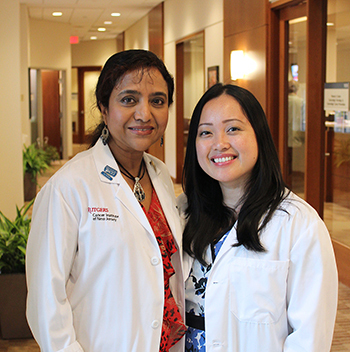 It is an effort that illustrates “the qualities of a good leader,” say her peers: “Machado is well organized and makes sure patients and treatment nurses are her priority for excellent and safe care. She also accommodates constant scheduling changes and does so smoothly and effortlessly to make sure patients are receiving the therapy needed.” Along with adult treatment scheduling, Machado also interacts with the pediatric area in helping to accommodate young adult patients with transfusion needs. She is also highly regarded for her clinical practice expertise and customer service, noted as “empathetic and attentive” to the needs of her patients and their families. This year’s Elizabeth Gibby Osborne Lecture featured Faith Roberts, BSN, MSN, who is the director of Magnet/Professional Practice and Parish Nursing for Carle Foundation Hospital in Urbana, Illinois. In her talk “From Wedding Rings to Nose Rings,” Roberts drew from her extensive experience in administration, education, and clinical practice to discuss challenges with generational differences across the nursing field. The lectureship and Nursing Excellence Awards are underwritten in part by the Elizabeth Gibby Osborne Lecture and Scholarship Fund. Because of Mrs. Osborne’s strong belief in education, her husband Bill established the fund after her death from cancer in 2004 to support peer learning opportunities for oncology nurses at Rutgers Cancer Institute. “We are honored to celebrate our award recipients this year and to acknowledge all of our nurses for the professionalism and dedication they bring forth every day in serving our patients and advancing the field. Because oncology nursing is continually evolving, nurses must be prepared for changes and challenges in clinical practice, education and research. Nursing education and professional development opportunities such as the Osborne Lecture help our nurses remain ahead of the curve in these areas,” notes Carla Schaefer, BSN, RN, OCN, nurse manager of the adult treatment area at Rutgers Cancer Institute. Rutgers Cancer Institute of New Jersey (www.cinj.org) is the state’s only National Cancer Institute-designated Comprehensive Cancer Center. As part of Rutgers, The State University of New Jersey, the Cancer Institute of New Jersey is dedicated to improving the detection, treatment and care of patients with cancer, and to serving as an education resource for cancer prevention. Physician-scientists at Rutgers Cancer Institute engage in translational research, transforming their laboratory discoveries into clinical practice. To make a tax-deductible gift to support the Cancer Institute of New Jersey, call 732-235-8614 or visit www.cinj.org/giving. Follow us on Facebook at www.facebook.com/TheCINJ.